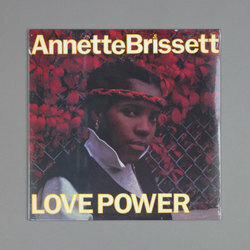 Annette Brissett - Love Power. Vinyl LP. Bleep. Annette Brissett’s 1983 LP for Wackies gets reissued by Lloyd ‘Bullwackie’ Barnes’ label. As with many Wackies records from the era something of an all-star cast was assembled to be the backroom staff of Love Power. Bullwackie and Itopia’s Fabian Cooke were on production duties, often with a little assistance from Prince Douglas; Cooke and Ras Menelik handle percussion; and Sugar Minott and the Love Joys provide backing vocals. This all sets the scene for a series of assured performances from Brissett. Whether turning in Lovers Rock (‘Love Power’), deep roots (‘Betrayed’) or disco-reggae (‘Drums’) Brissett rises to every challenge with aplomb. Her voice, by the way, resembles Carroll Thompson.